On Anna's recommendation, I bought a copy of The Sewing Machine Attachment Handbook, which turns out to have been the book I've been looking for all my sewing life. Did your sewing machine come with a box of tiny, weirdly-shaped feet? Then you need this book. There are clear instructions for guides, hemmers, rufflers, binding and cording feet, sequin feet, walking feet … and on and on. If you can screw, bolt, strap or clip it to your sewing machine, I think this book covers it. My favorite guideline for judging sewing books is by whether or not they make you want to sew — and this book makes me really, really want to sew. I think the hemming foot instructions alone are going to make my sewing life better. It's also kindled in me a deep and painful longing for something called a "bias cutting guide" — a doodad that clips to the end of your scissors so that you can cut bias tape without all that painful marking. I wants one, I do. Couldn't turn one up on eBay, though; does anyone have any leads? Bias cutting guide made me groan! That book looks like a must have! Thanks!I have one of those bias gauges, I like it but it has two problems – first, it doesnt fit well on a lot of scissors, and second, at the widest setting it still only makes narrow strips (1 is the max on mine, I think, so 1/4 after double folding). I love the DIY one at that link – it would be great to have a set in all your favorite widths!! They show up fairly often in sets of vintage sewing machine attachments. You would not only get the gauge, but other feet you can use as well! For strip cutting, try a slotted ruler like http://www.joann.com/joann/catalog/productdetail.jsp?CATID=cat3546PRODID=prd2856 and a rotary cutter. A while ago I cut a jelly roll of strips (light contrast against a jelly roll for a flying geese quilt) in about 15 minutes. So THATs what that thing is! Id better read this book so I can identify all this sewing stuff that Ive inherited from different people in my life. There might be things I need and already have. Actually I think I have 2 of these. They work well on older styles of scissors but dont fit well on my Fiskars.I do better cutting bias tape using my rotary cutter but its a nifty doo-dad to have. The title of the book gave me the willies–I could only think of my moms 1947 Singer with the giy-normous buttonhole attachment and how many frustrating hours she spent trying to get it to work, not to mention the ruffler . But when you say it gives instructions–now youre talkin. Hemming foot. My mother had a portable sewing machine with a hemming foot when I was in high school. I loved it so much I didnt want to leave home for college until Mom said I could take the sewing machine with me. Imagine my disappointment when I bought my first machine and it did not have a hemming foot! Ive never quite go over it. 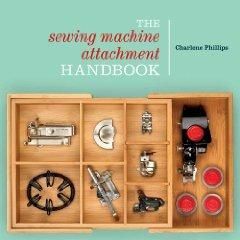 Great book recommendation, sewing machines have always confused me 😉 I think this book will help, thanks for posting! i borrowed the book from the library. I wish the description stated how it was centered on old machine feet instead of modern machines.